The students at the Mass Media Institute had extremely insightful series of alumni interaction sessions in the month of July 2018. It began with Pankaj Solankhi, from the 9th batch of IMM who shared his experiences as an Assistant Director with Rakyesh Omprakash Mehra Productions for the recent release, ‘Fanney Khan’. He shared the essence of how patience and consistent effort is the key mantra to getting where you want to be. Pankaj also discussed about his stint with Excel Entertainment for the projects namely, ‘Baar Baar Dekho’, ‘ROCKON 2’ and ‘Dil Dhadakne Do’ giving the students an understanding of how the direction team of a film functions at large. Delna Shroff, from the 8th ADMM Advertising (PG in Mass Mass Media) batch who is currently a Copy Supervisor at L&K Saatchi and has been awarded as Young Leader 2018 by the agency, discussed ‘Advertising in the Digital Age’ through few case studies of award winning campaigns. Ankit Jain, from the 6th batch of ADMM Entertainment, now the Senior Show Producer, 93.5 RED FM shared his journey with the students. 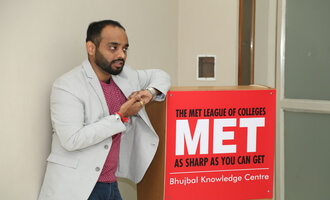 He spoke to them about his recent project with RJ Mallishka, the viral video on Mumbai Rains. Ankit had co-scripted and acted in it too.